Exchange Theatre sets The Misanthrope in a contemporary newsroom full of gossip, affairs, backstabbing and cocaine-fueled all-nighters. Alceste loathes the way his colleagues behave, but fancies the flirtatious Celimene in spite of his prejudices. His jealousy and inability to be polite to his colleagues causes a litany of issues that play out over their broadcasts, eventually leading to his lonely downfall. The spectators are cast as the TV studio audience; a flashing sign above our head encourages us to applaud. Unfortunately there isn’t much to celebrate in this production set around two-out-of date performers trying to re-launch their career. The initial impression of the set is one of excitement and exuberance, but Emily Bestow’s design leaves the stage cluttered and incredibly busy. The actors must awkwardly navigate their way through whilst juggling a quick costume change, and avoiding being hit by a colourful disc of some sort. It’s a shame you can’t see the band through this disorientating mess. On Sunday night, theatre people ( and hopefully others) up and down the country tuned in to BBC Four to watch Battersea Arts Centre and Arts Council England take over the former Television Centre, now a building site for luxury flats. 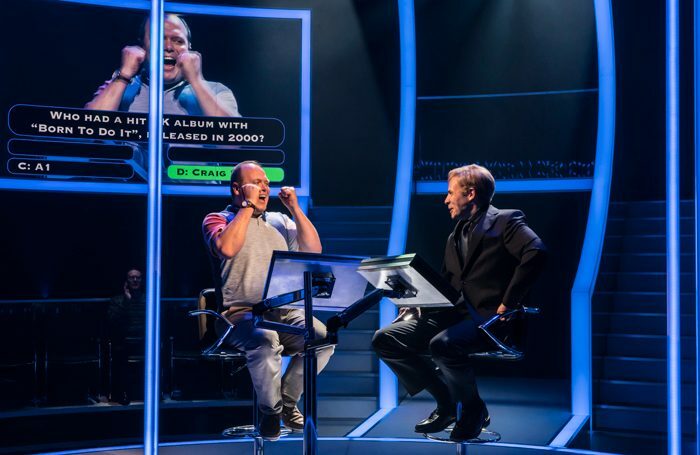 Over two hours, four theatre companies streamed their work for live audiences in the comfort of their homes, to push the boundaries of theatre’s adaptability to the popular small screen and to challenge typical TV programming. I watched in bed and with twitter open so I could keep half an eye on #livefromTVC; it was a gloriously anarchic experiment that I hope ushers in a new era for telly and theatre even though not every element worked as well as it could have – but that’s the point of experimentation. Gecko’s The Time of Your Life celebrates life cycles in a circular swirling movement with a “Truman Show”-style storyline of meta-television. The close-up nature of telly supports the characters’ intimacy and expressiveness well, but the narrow framing reduced their normally expansive work to a much smaller scale. I didn’t mind the spinning camera work, but twitter buzzed with complaints of dizziness. It was rough and ready, with limbs often out of the frame and movements ahead of the action, but that supports the “liveness”. Their piece wasn’t the most accessible and most suitable to open the evening either; Richard DeDomenici’s Redux Project would have been a more appealing start to non-theatre goers. The long running Redux Project is adapted for the evening with joyfully irreverent recreations of classic moments from BBC television history. DeDomenici has a friendly, laid-back persona thinly veiling biting political commentary just as sharp as “The Revolution Will Be Televised”, but less blatant and without personal attacks. The live artist aims, “to disrupt the cinema industry by making counterfeit sections of popular films”; he satisfies with powerful alternative perspectives that are funny on the surface, but pose bigger challenges to cinematic convention underneath. Common Wealth’s No Guts, No Heart, No Glory is a verbatim piece sharing the experiences of young women from Bradford who are Muslim boxers. It’s a powerful piece challenging stereotypes and giving voice to a demographic often ignored at best or stigmatized at worst. This worked brilliantly on telly, capturing the intensity and passion of the characters despite some strange camera angles. Backstage in Biscuit Land by Touretteshero (Jess Thom) becomes Broadcast from Biscuit Land, the wonderful show that’s inclusive, informative, and contains plenty of biscuits and cats. Thom has a noticeable form of Tourettes that manifests in physical and verbal tics used for comedic effect in her show, and a reminder that understanding for people with disabilities is still lacking. In a more surreal moment, Thom reminisces about a particularly funny tic about Keith Chegwin in a quiet theatre; cameras then reveal Cheggers there in the live studio audience. The variety of the evening reminds audiences of the power of live performance and its relevance to everyone. I’m certain that anyone who watched would be able to find something appealing in the evening, and hopefully discovered a company or artist previously unknown to them. Even if it was mainly theatre makers and goers that watched, TV can still reach audiences that are otherwise unable to travel to an individual performance. At best, those who don’t consider themselves theatre people will have found pleasure in the event, and there’s hope that the powers that be discover there is room for dancing biscuits, physical theatre and political performance on our small screens as well as our big stages.